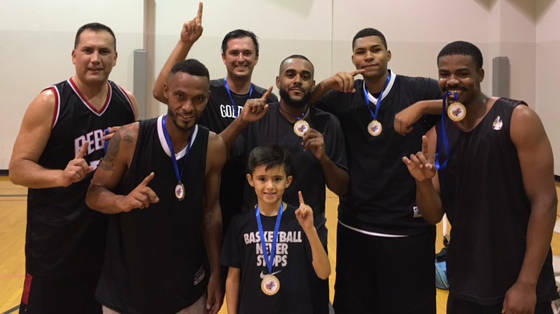 Kelly Lehr Boulder City Parks and Recreation’s men’s summer basketball team champions Slow and Steady, from left, Mike Carboni, Terry Robinson, Aaron McMorran, Sheldon Hutchins, Anthony Brown and DeVonte White join with Aaron McMorran II, in front, the team’s mascot and ball boy. The Boulder City Parks and Recreation Department’s men’s summer basketball league came to an end last week with two close games in the semifinal and championship games. Woodbury Law narrowly beat B.C. Kids 51-48 on Aug. 31. Big under-the-basket defensive plays from Nate Hafen, Brigham Church and Jordan Peel sent Woodbury Law into the championship game to face Slow and Steady, according to Kelly Lehr, sports coordinator for the department. The championship game went into overtime with a quick catch-up scoring spree from Jordan Peel and Billy Ferrence from Woodbury Law. Slow and Steady’s foul shots dominated the rest of the game with big points from DeVonte White and Terry Robinson in the final seconds. Slow and Steady pulled off the win 53-50. The men’s basketball league will resume in January.